Editor’s update: The new 90kg women’s weight class has been formally adopted by the International Weightlifting Federation. The new women’s weight class breakdown is 48kg, 53kg, 58kg, 63kg, 69kg, 75kg, 90kg, +90kg. In breaking news that was first announced this morning on the International Weightlifting Federation’s (IWF) Twitter account, the organization’s Executive Board accepted a long-awaited 8th woman’s weight class. 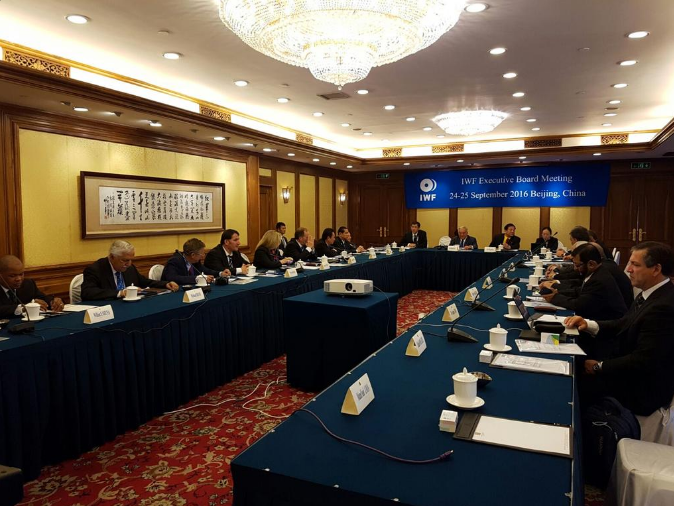 The IWF Executive Board met on September 24 and 25th in Beijing, China. The new weight class for women will be 90kg (198 pounds), with the superheavyweight category becoming +90kg. An additional 8th category has been in conversation since May of this year, as the IWF and the International Olympic Committee as a whole have made gender equality a priority. While this new weight category does represent a 15KG (33lb) increase over the next lowest category, many fans, coaches, and athletes have suggested a category was needed at higher end of the woman’s weight class spectrum. It will be interesting to see how this new category changes the international landscape of the woman’s superheavyweight category. Looking at results from the last three Senior World Championships, on average roughly one-third of the women in this category have weighed in at less than 100KG (220lb). The next significant IWF competition is scheduled to be the Youth World Championships, to be held in Penang, Malaysia, from October 19th to 25th of this year. Due to the timing of this news, this author’s assumption is that this new body weight category will not be included in this event. In US Weightlifting news from earlier this year, it was announced on August 31st of this year that if the IWF announced an 8th women’s category, USA Weightlifting (USAW) would include it for the 2016 American Open. That competition runs from December 8th to 11th in Orlando, Florida. Lot number – lowest first. *Previously “Bodyweight – lowest first; if identical, then:” was second in the methodology. For the sake of simplicity: The above means the athlete who totals the most will still win. However, if there is a tie, the athlete that made the total first will win the tie breaker. If athlete A totals 200KG and snatches 90KG and clean and jerks 110KG, and athlete B totals 200KG but snatches 88KG and clean and jerks 112KG, the champion will be athlete A because 110KG was successful before 112KG. What do you think of these new changes? Is 90KG the correct new weight class for women? Who do you think will be top national and international athletes at this weight class? Will the elimination of bodyweight tie add excitement to competitions? Let us know in the comments below what you think.